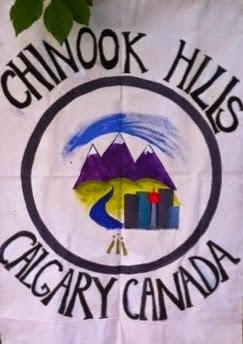 Chinook Hills Druidry: Pictures from North Glenmore Park walk! Our Druidwalk on May 28th was at North Glenmore Park on a beautiful sunny day. This park seems huge, with lots of walking trails, both along the edge of the Elbow river and the Glenmore Resevoir, as well as along the manicured lawns and some less than manicured natural areas. North Glenmore has something for everyone. The park is a perfect place to see the oxbows in Elbow River feeds and where the river feeds into the Glenmore Reservoir. There is a long flight of stairs down to Blue Heron picnic site. I think this would be an amazing spot for an evening get together!